lucy violet vintage: It's A Retro Cook-Off! Good afternoon everyone, welcome to "It's A Retro Cook-Off!" Thanks for dropping by, and an even bigger thank you if you've popped on an apron yourself and joined in. We love you guys! You're awesome! I like to think of "It's A Retro Cook-Off!" as the bloggy equivalent of an old-school Smorgasbord. So grab a plate, and check out everyone's offerings, I'm sure you'll find something to tempt repel your tastebuds. I found this recipe on retro Ruth's fabulous blog The Mid Century Menu. It is described as "a mouth-watering fluffy filling, layered with chocolate cookies"
You know what's missing don't you? A big glug of yellow food colouring! I can't believe I forgot to add this - a splash of 'poison' would've brought this cake to life! It looks so insipid compared to its glowing/radiactive 60's predecessor. I was pleased though, that I managed to turn it out of the tin in one piece! Kylo-meter: 2/5 fluffy? yes, mouth-watering? no. Not yellow enough. Would've been nicer without the biscuits. 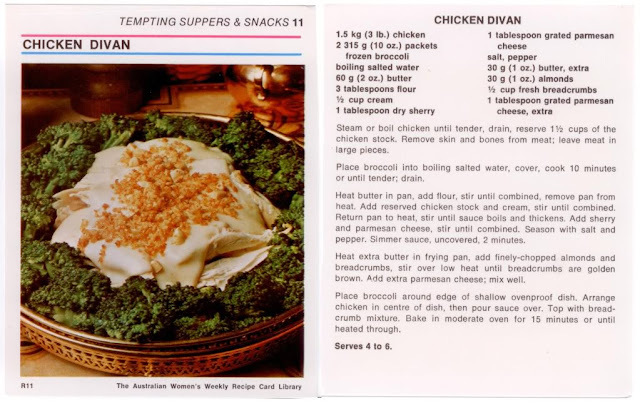 Chicken Divan was the signature dish of a 1950's restaurant in New York, called The Divan Parisienne. Kylo-meter: 2.5/5 there was really nothing wrong with this, there just wasn't anything right with it either! A waste of beautiful, fresh brocolini! Another recipe I found here, courtesy of retro Ruth. According to Ruth canned tomato soup is a common ingredient in depression era and mid-century cooking. I've baked chocolate cakes with beetroot, potato and zucchini in them, but I have never made one with tomato soup before, have you? so good (and so easy) I implore you to make it! you won't be disappointed, promise. Kylo-meter: 4.5/5 my only negative, the ooze factor during cooking. Antho-meter: 3.5/5 Anthony liked this, but preferred the Pineapple Chiffon Cake. Once again I'll mention his devotion to the Orange Slice biccy - do not base your decision on this man's opinion! His tastebuds are clearly taste-challenged! I kid you not, I have just served him a slice of Pineapple Chiffon with two Orange Creams on the side! Gross!!! Okay, that's it from me. I've got a lot of left-overs to get through and wonderful blogs to visit. It's going to be a great Saturday arvo. Thanks to retro Ruth for kindly sharing her recipes, thanks to my partner-in-crime, the lovely Donna. Thanks again to you gorgeous retro chefs out there for sharing your disasters delights, and thank YOU for reading. The Pineapple Chiffon Cake looks pretty tasty, and I remember when the chocolate cake with tomato soup recipe went around back in the day. In fact, I think I remember seeing the copy that my mom typed on an index card. I think my Swedish Salad Mold is way out ahead in the ugly category. By the time I finished making it, I was so queasy that I didn't even taste it! I'm definitely going to try the cake, as I think it's the first thing made with a tin of soup that looks even vaguely edible. Chicken Divan though - barf! I've added my link above. The cake sounds intriguing. Really, who've thought tomato soup could be an ingredient and not detectable. The chicken divan looks pretty awful. So awful it looks good! I bet you had fun making those recipes. Why do so many retro recipes require sherry? My mother used to put sherry in her spaghetti sauce. Disgusting. Great work Kylie! I'm tempted by the cake, might be one for Mr Ouch! You win! That is a lot of stuff. I just posted!!! Sorry late. Had to stay at work late on a Friday. BOO! But I ran home and made dinner. Husband and kid are like "what has got into her?" Oh my goodness I came across two retro food challenges on my blog roll and after recovering from falling about laughing had to find the sauce, I mean source. I actually want to make the tomato sauce cake, hmmm nutritious. Thanks so much for a great laugh on a cold wet day here in Christchurch!! despite the oozing scab references, im going to try the cake!....that is once Niccy has left for the mine job...she is a pastry chef and there is just no way in hell this would be allowed!!... "not under my roof missy!! "....no she would never speak to me like that, but would def take the kitchenaid with her! OMG,I just found you/this via Max of Blackbird has Spoken,and I'm blown away!!! I have some hideous retro cookbooks,and a cocktail book,and often threaten to try a few "treats"....but haven't yet had the courage! I do,however,use my Mum's Women's Weekly (an Australian classic magazine) Classics cookbook from time to time.But it's not as terrifying as what I'm seeing here!!HAHAHHAAAAAAAAA! Love it.Love that you've tortured your loved ones! I suspect cakes are one of the few things that stand up to the years! This cook-off has been so much fun! Thanks to you and Donna for hosting it. ive been thru them all...what a hoot. niccy and I having been having a good cack at the efforts...what a great idea. Thanks again Kylie. I have been giggling at the computer all night. You have outdone yourself Kylie - and that chocolate cake really does look yummy. I will have my piccies up later this afternoon. the chiffon cake looks the part! would try this, like a bite. (have to add i don't mind an orange slice either!). i can't believe soup or anything canned is added for interest... having said that... i may have done a similar addition in the past, e.g. when cooking on imaginary stove. it didn't fancy either of the takers. we ate it, simply 'cos we were hungry. what a brave vintage star you are! amazing how times evolve, and how our taste and looks palette evolve accordingly. what can i say? i love retro, and i love your tribute! Just arrived home and hope I have not missed all the fun... I LOVE your recipes, the chiffon cake and the Choc cake tomato and all look delicious - YUM. This was a fantastic retro celebration, look forward to checking out the rest of the recipes. Wow tomato soup in a cake, now there's something you don't see everyday, or anyday for that matter. Some 'interesting' dishes in the link-up. I am so glad that I've fully recovered from my tummy bug, because if I had looked at those pics on Monday or Tuesday ...! Chicken divan - so gross! May have to wait till later to check out the other links, not sure my just recovered stomach can take much more today!!!!! I fully intend to make the tomato soup cake just to see if I can fool the. I had a lovely seventies classic planned for you but am instead impersonating a devil on horseback as I am all crispy like bacon right now and just need to hug a prune. How long is your link up for? Just LOVED this post. You must do this again! I read all of the recipes and visited all the other blogs it was so much fun. What I really liked were the scores you gave! Now I looked at the tomato cake in detail on Ruth's blog - but I just can't see myself making it despite all the rave reviews. I don't think I'd be able to get past the comments you both made about how bad it looks/smells before you baked it! Please say you'll have one again some day. You are up to 12 recipes! This is awesome. Makes for a funny weekend. Went for a walk with my Mom today and told her what you were up to. She finds it all a hoot and will be trolling through this evening. Oh what fun Kylie! I am adding the Black Magic cake to my 'must make' list. Job well done girls! The Retro Cook Off has been a great success, nice hostessing, Kylie! I actually thInk the cakes look OK, despite the tomato soup ooze, which does sound a little off-putting... The chicken in a bed (that's a divan, isn't it?) is similar to a dish a friend of mine used to make, called Margot's Chicken, after her mum's neighbour who claimed to have invented it. Broccoli at the bottom, chicken in a mushroom soup sauce flavoured with curry powder, breadcrumbs on the top. So, it's an internationally recognised dish! Goodness! I've enjoyed this post Kylie, such a great variety, most of which I wont be trying.